SMH-ASSIST » At Trillium Lakelands, Feed All Four is our way of being! At Trillium Lakelands, Feed All Four is our way of being! At Trillium Lakelands, we developed the initiative Feed All Four due to our ongoing need to align teaching and learning with safe and accepting schools, mental health, healthy active living and student well-being. 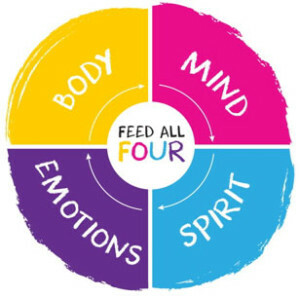 At its heart, Feed All Four is a “way of being” that engages our students and staff in looking at wellness through the new lens of feeding the body, mind, spirit and emotions every day. We have seen a ground-swell of interest: since being shared with a few schools early in the 2014-15 school year, we now see most TLDSB schools engaging staff and students in this balanced approach. Research indicates that supporting the body, mind, spirit and emotions of an individual increases a sense of well-being, connectedness and resilience. It also improves student achievement. Each of these elements needs to be fed consistently to optimize achievement and well-being. A visit to the tweets with the hashtag #feedallfour on Twitter demonstrates the many ways that educators and students are incorporating Feed All Four into their daily lives. Some examples feature students and staff being active, supporting each and sharing information about wellness that will support our entire community. Community partners have been invited to incorporate Feed All Four into their organizations as well as into the work they do with students. At home, TLDSB families can use the concept as a checkpoint for discussions and activities centred on wellbeing. And Feed All Four is being shared widely across the province with positive feedback from all stakeholders.